Large crowds participating in Mohammad Sahwan’s funeral procession in Sanabis. 17 March 2017 – Mohammad Sahwan, a victim of excessive use of force by police in 2012, died of sudden cardiac arrest yesterday in Bahrain’s Jau Prison. Mohammad Sahwan is the first political detainee to die in Jau Prison since 2011. 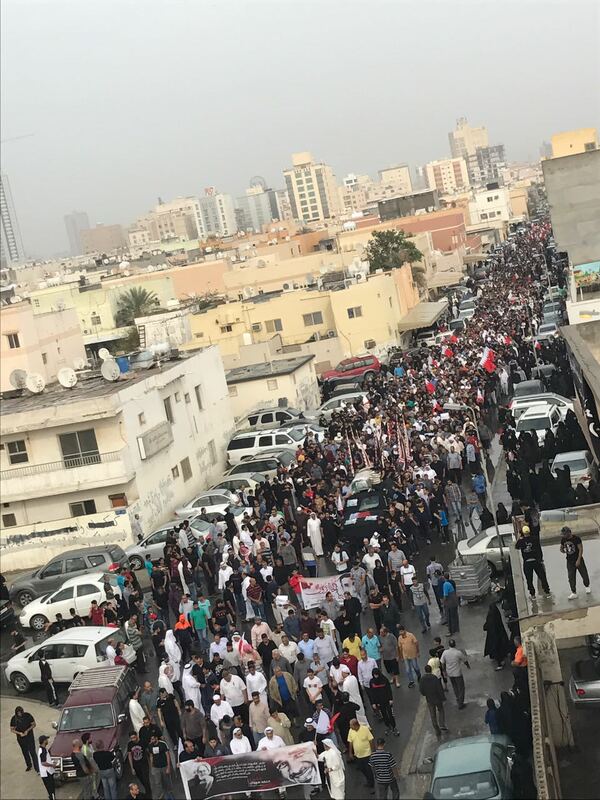 Today, his funeral in Sanabis was attended by thousands and met by excessive use of force from the police. We, the undersigned organizations, condemn the government’s treatment of Sahwan and its attacks upon his funeral procession today. Sahwan was previously injured in April 2011, after the king declared a state of National Safety and enabled the security forces to violently suppress the Arab Spring protests. Sahwan was shot in the back, legs, and head by police with birdshot pellets from a shotgun. Sahwan was never treated for the 80 birdshot pellets which entered his head. His family told local press in 2012 that his life was at risk as a result of the denial of care. He was unable to receive full treatment for these injuries and prevented from receiving medical care, despite multiple requests, according to the Bahrain Center for Human Rights (BCHR). On 16 March 2017, Sahwan reportedly collapsed and died of sudden cardiac arrest. 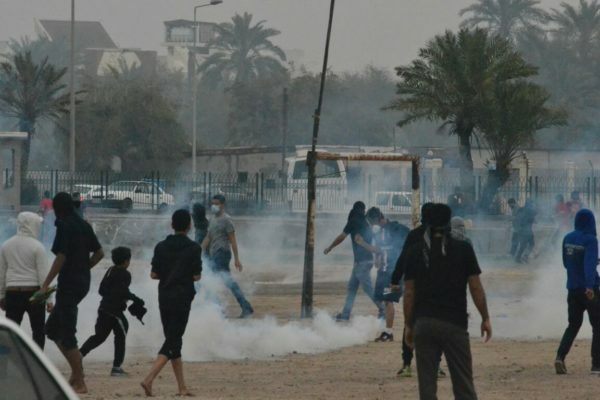 Teargas fired near the funeral procession in Sanabis. 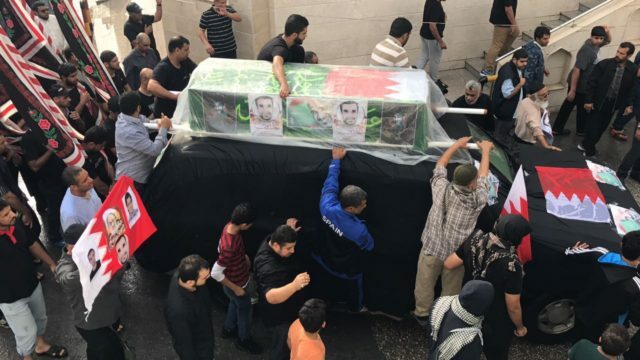 Sahwan’s funeral was held today, Friday 17 March, in his hometown of Sanabis. A crowd numbering in the thousands marched in his funeral procession. Funeral-goers also demonstrated against the political and human rights situation in the country. Security forces responded to the funeral march with excessive use of tear gas and birdshot against demonstrators. At least one protester suffered a birdshot pellet injury in his eye. A birdshot pellet lodged in the eye of a funeral attendee. 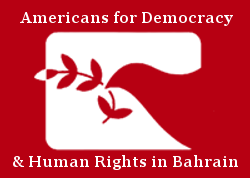 The Government of Bahrain violated Mohammad Sahwan’s right to liberty (article 3, Universal Declaration of Human Rights and article 9, International Covenant on Civil and Political Rights), right to not be tortured (article 5, UDHR and article 7, ICCPR) and right to a fair trial (article 11, UDHR and article 14, ICCPR). We condemn the Government of Bahrain’s arbitrary detention and torture of Mohammad Sahwan, as well as his consistent denial of access to medical care. We additionally condemn the excessive use of force employed against Mohammad Sahwan’s funeral today. Finally, we call for the release of all arbitrarily detained and unfairly convicted persons in Bahrain, and for the uninhibited access to healthcare for all prisoners.